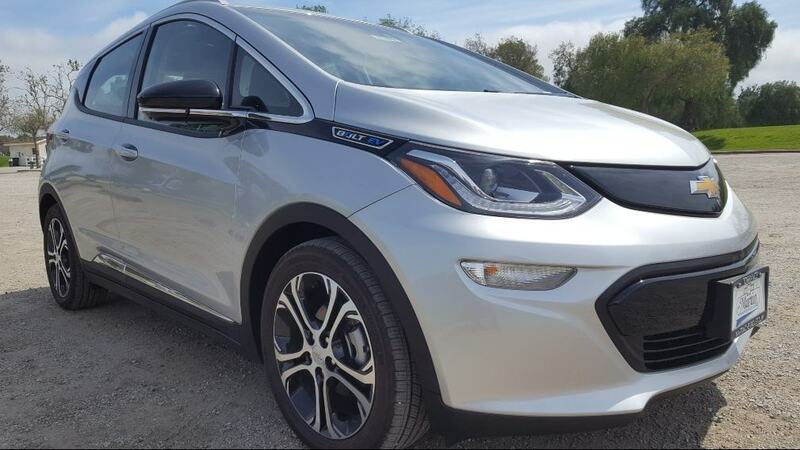 Test driving the 2019 Chevrolet Bolt EV for this review was a bit of a transformational experience for me. It was my first time behind the wheel of a Bolt EV and I was literally thrown back into my seat from the torque. I know all journalists like me talk-up the serious torque electric cars have by nature. But, I hadn’t experienced it first hand for myself – until now and, wow! Electric vehicles have been increasing in popularity for a number of years and that trend is going to continue. If you’re thinking EV then the 2019 Chevy Bolt EV has got to be at the top of your list. 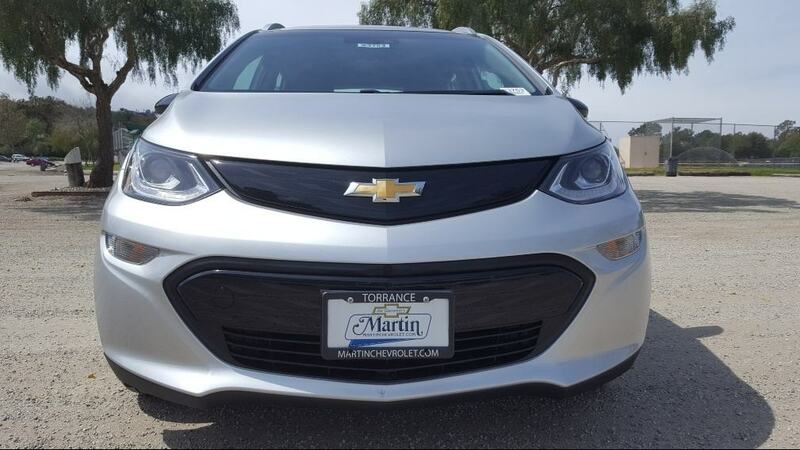 I recently picked up a 2019 Chevy Bolt EV from our friends at Martin Chevrolet in Torrance, California. If you’re thinking of buying a Bolt, or any Chevrolet, you have to hear Martin Chevy’s General Manager, Lewis Cook on the car buying process! 2) Range – 238 miles. 3) Space – 56.6 cu. ft. 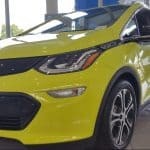 When it comes to trim options, Chevy keeps it simple with its 2019 Bolt EV. You have two trims to choose from but you can still accessorize both nicely. 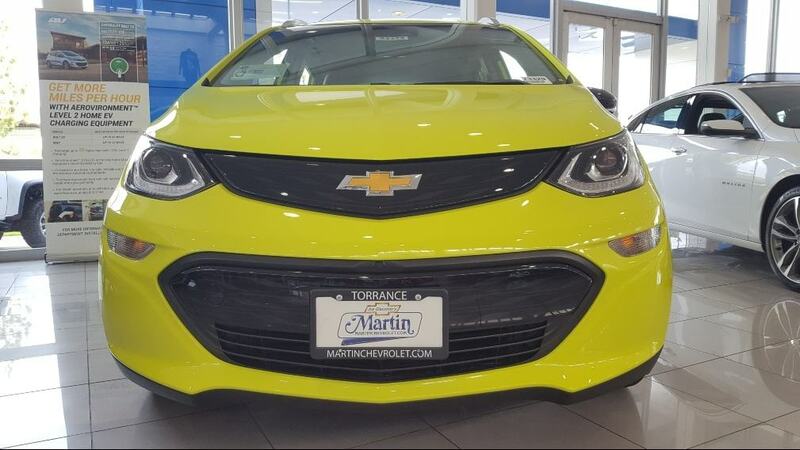 The color screams electric vehicle! There’s the base model LT with the manufacturer’s suggested retail price starting at $37,495. And there’s line-topping 2019 Chevrolet Bolt EV Premier with a starting MSRP at $41,895. You guessed it – it’s the Shock (yellow) color! First, you need to get your Bolt equipped to your liking and that will impact your price. Second, with the Chevrolet Bolt being an electric vehicle, you have a federal tax credit and state EV incentives that could come into play. Third, and most importantly, our friends at Martin Chevrolet are guaranteed to give you the best deal and overall experience on any vehicle that suits your needs. A bit more tranquil in silver. 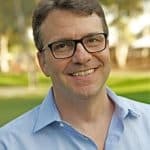 Email me and I’ll personally connect you Tom [at] iDriveSoCal [dot] com. Or just walk into Martin Chevy and say hi to General Manager Lewis Cook and his entire team. 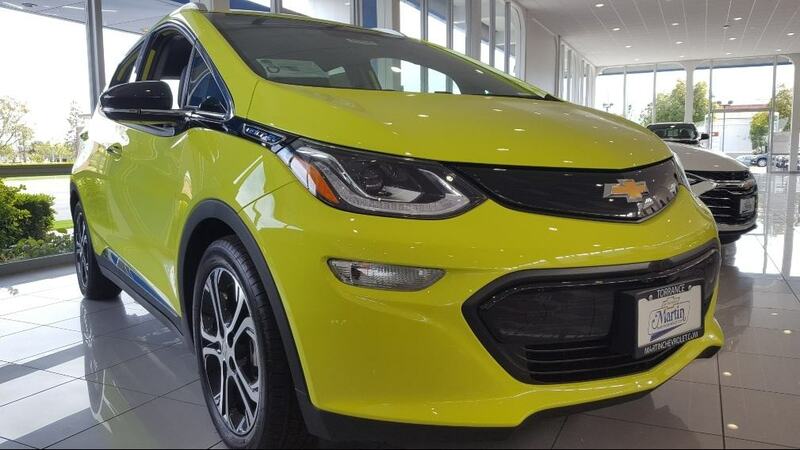 Whether you go with the LT or Premier trim you’re Bolt will have the same electric drive unit. And a powerful unit at that as it delivers 200-horsepower and 266 lb-ft of torque. 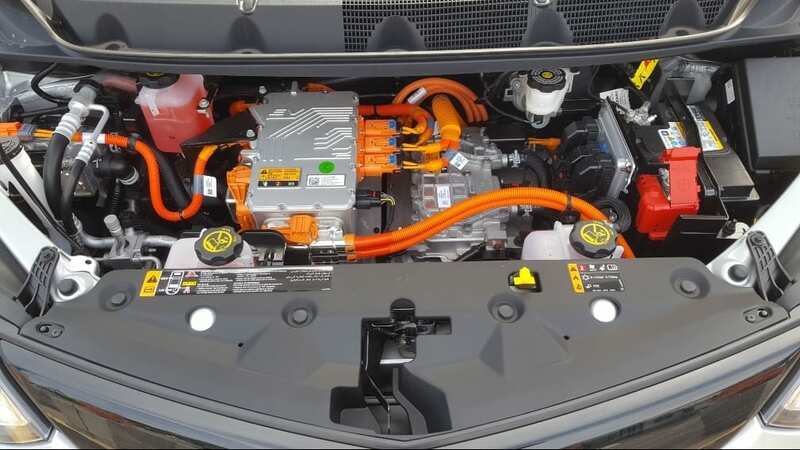 2019 Chevrolet Bolt EV under the hood! And that power is felt 100%. During my test drive, the first time checked what kind of power the Bolt had to offer, my head snapped back to the headrest instantaneously. And what’s more remarkable is that I was going uphill at the time. And, I wasn’t even flooring-it I’d say I was two-thirds throttle at the time. That’s when the Bolt really got my attention. 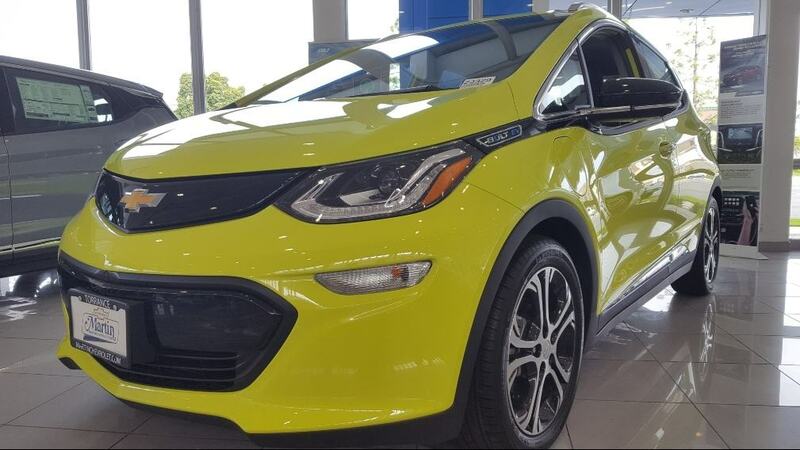 Now, my friends at Martin Chevrolet gave me a top-of-the-line Premier 2019 Bolt EV to test drive. And because it was the top-of-the-line, and I didn’t research heavily prior to my drive, I would have sworn that my test drive model was all-wheel drive. But it wasn’t. 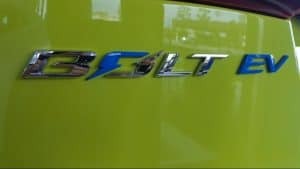 In fact, Chevrolet only offers the 2019 Bolt in front-wheel drive. 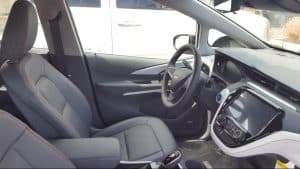 More on driving the 2019 Chevy Bolt EV; it has a rather upright seating position in relation to the road. More like a truck or crossover SUV than a typical sedan. 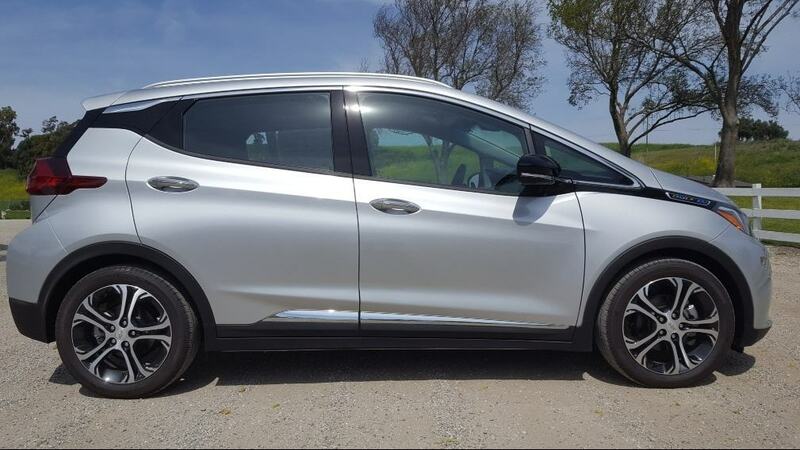 2019 Chevrolet Bolt EV passenger side rear. But the Bolt isn’t high off the ground like a truck or crossover SUV. Making it very comfortable to get in and out of. Also, the Chevy Bolt EV was super-quick with all that torque. It was a blast to drive. ’19 Chevrolet Bolt EV passenger front. During my test drive, the Bolt EV was so responsive that, I wondered what the 0-60 mph was. And simply researching a little more I see Chevrolet, is likely so proud that they, post it on their website. The 2019 Chevy Bolt EV is rated to go from 0 to 60 in a highly respectable 6.5-seconds! Very nimble. Easy to navigate tight spots. Both in traffic and parking situations. And it has a great turning radius. 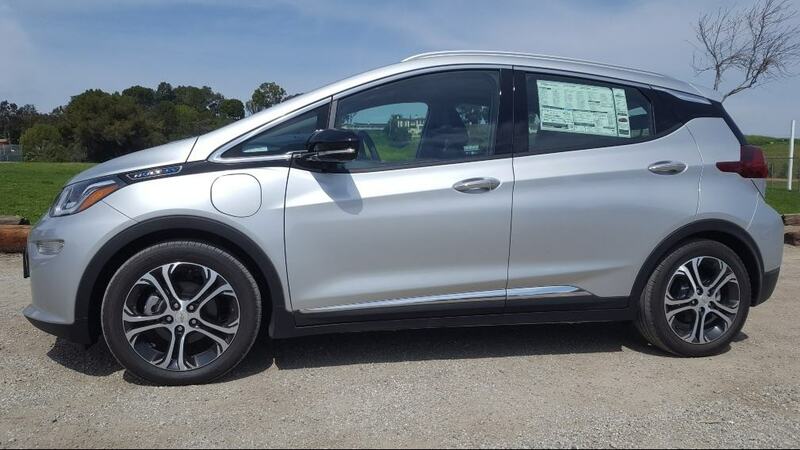 2019 Chevy Bolt EV driver profile. My guess is that the sure-footed-ness in driving the 2019 Chevrolet Bolt comes from all of the above. But also, a big nod of thanks probably needs to go to Chevy engineers. I’ll bet the picked the perfect spot for the electric vehicle’s heavy battery pack when designing the car. And that likely balances out everything. 238-Miles on a Full Charge! There’s no doubt that the most common concern with EV buyers is whether or not they can get far enough without needing to recharge. And then when you do need to recharge, where does that happen? 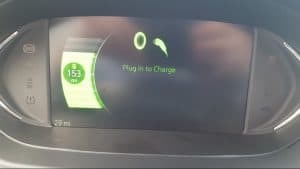 2019 Chevy Bolt EV charge screen. But with the 2019 Chevrolet Bolt EV delivering 238-miles on a full charge, range anxiety is pretty much a non-issue. That’s basically a battery in an electric vehicle that pretty well matches with an average car on a full tank of gas. And that’s the benchmark most all EVs have been shooting for. 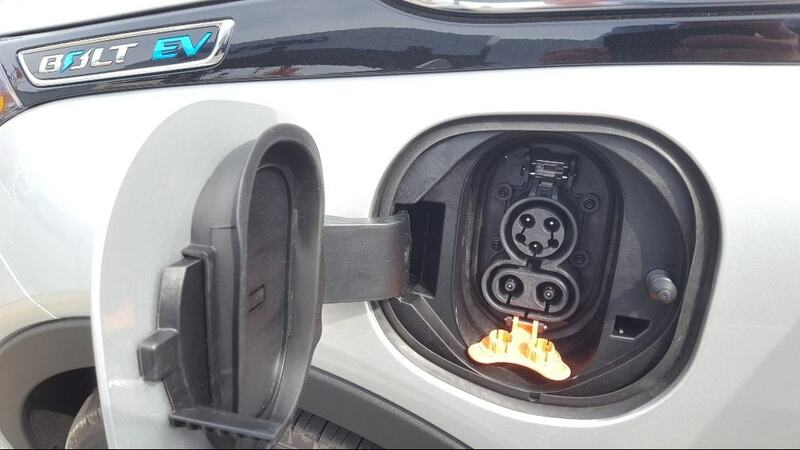 2019 Chevrolet Bolt EV charging input. And in addition to having great charging capacity, the Bolt EV offers three different ways to be charged. There’s Level 1 charging which is the most basic. It uses a portable 120-volt charging cord and plugs into any 3-prong outlet. Charing this way will take you a while though as every hour of charging delivers about 4-miles of driving distance. The recommended 240-volt, Level 2 charging is the fastest way to charge at home. That will give you 25-miles of driving distance for every hour of charging. In this case, the charging unit does need to be professionally installed at your house. Though it’s only available at public charging stations, DC Fash Charging is the quickest fix for your charging needs. These intense sessions will give you about 90-miles of driving distance in a mere 30-minutes! And you can easily locate these charging stations through apps like the My-Chevrolet-Mobile app. And if the 238-mile range and many convenient options for charging weren’t enough. 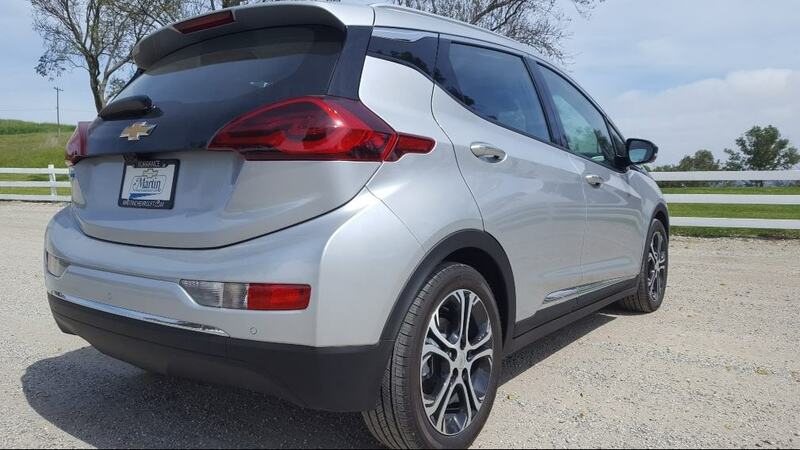 Chevrolet has also equipped the 2019 Bolt EV with additional functionality to maximize the battery’s charge and total range. 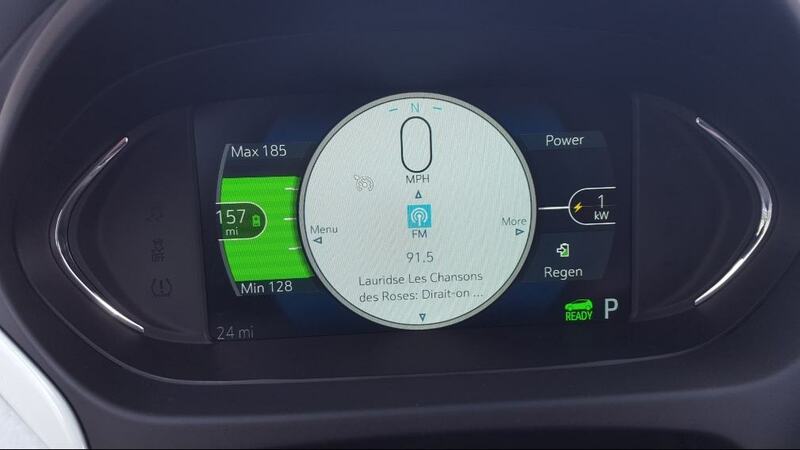 2019 Chevy Bolt EV charge and regen indicators. 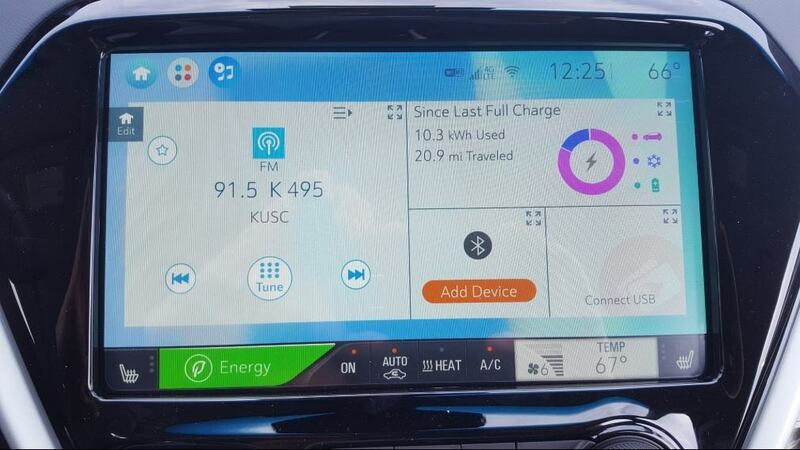 You can monitor and control how your Bolt EV’s charge is being used through different in-dash displays that measure driving behavior, climate settings and accessories being used. By monitoring and adjusting those during use you can extend your range or maximize your battery consumption accordingly. The Bolt EV even includes different ways to recharge its own battery through normal vehicle use. 2019 Chevy Bolt EV cockpit. By shifting into Low (L) gear that activates what Chevy refers to as One-Pedal Driving. And that allows the driver to use only the accelerator pedal to both go and stop. To go, you simply depress the accelerator pedal as normal. And to stop you lightly come-off the accelerator bring the vehicle to a gradual stop. The Chevrolet Bolt EV can also regenerate it’s battery when you pull and hold a single the gradually slow and stop the vehicle. The paddle is located on the left back side of the steering wheel. Chevy calls it Regen on Demand, and like One Pedal Driving, it’s designed to generate electricity which goes back into the battery. 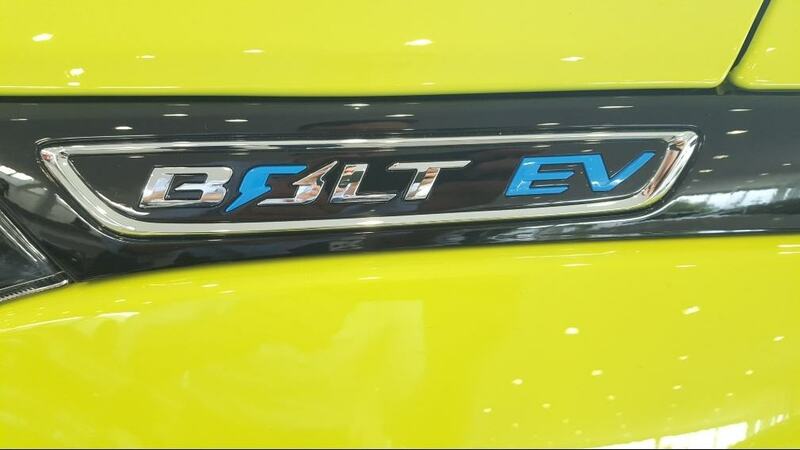 2019 Chevy Bolt EV rear badge. With either One Pedal driving or Regen on Demand, you may still need to use the normal brake pedal if you need to quickly stop. But Chevy thinks these range extending measures are pretty smart. And I’d have to agree. On the outside, the Bolt is sporty and compact. It looks sharp, with great lines. I wouldn’t quite call it’s styling futuristic, But, I would say that it looks pretty technically inclined. And it ought to as this car is loaded with tech. 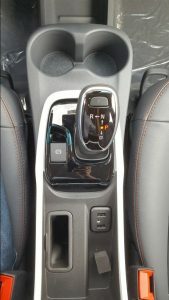 2019 Chevrolet Bolt EV Shock driver front. All new cars these days are computers on wheels but the Chevy Bolt EV is a club member for sure. And hats off to Chevy for going there. They not only did a fully electric vehicle but they did it very well. They even have that fluorescent yellow color they call Shock that seems to brag about their accomplishment with the bolt. 2019 Chevrolet Bolt EV Shock front. Combine all that and you might think you’d be left with a vehicle that hardly resembles what we’ve come to know as a Chevrolet but just the opposite. This is definitely a Chevy – I think most fairly educated car people could make that call from a football field away. 2019 Chevy Bolt EV front. And all that wrapped up in a vehicle that the National Highway Transportation Safety Administration (NHTSA) gave a 5-star overall vehicle score too. Nice. When I touched on the upright seating position earlier I didn’t elaborate on the spaciousness for all passengers and what has to be class-leading cargo capacity. 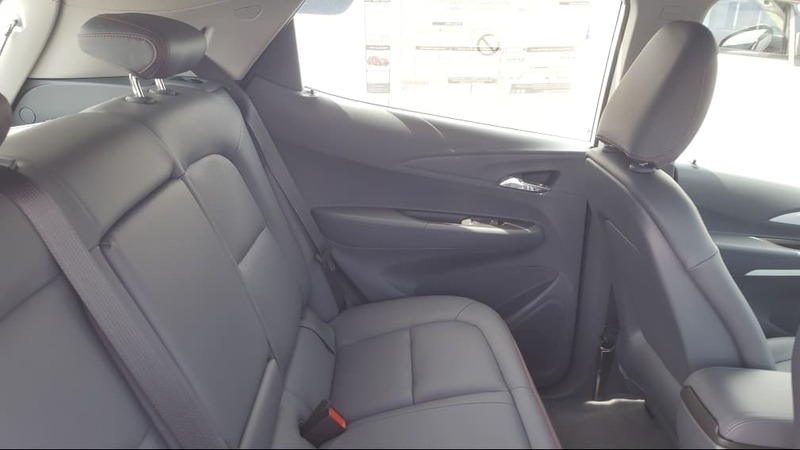 2019 Chevy Bolt EV back seat. The Bolt EV is very comfortable inside. Front seats and back have ample headroom, legroom and are plenty wide for us broad-shoulder fellas. 2019 Chevrolet Bolt EV trunk w/ a seat down. 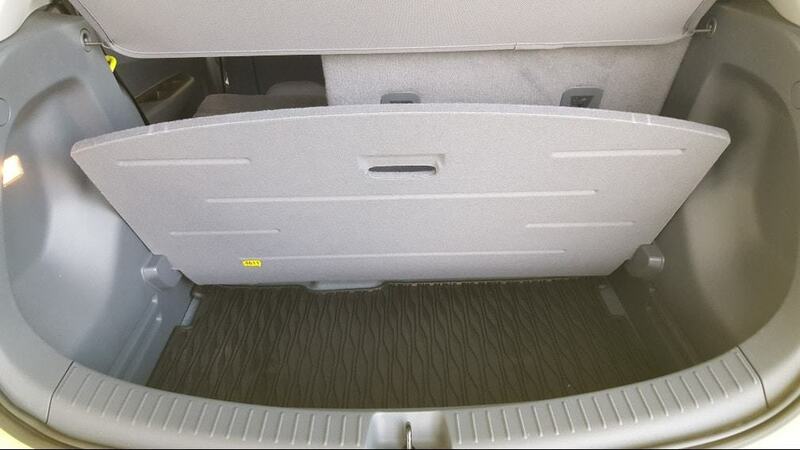 With the back seats folded down, you’re given a generous 56.6 cu.-ft of nearly flat cargo space. 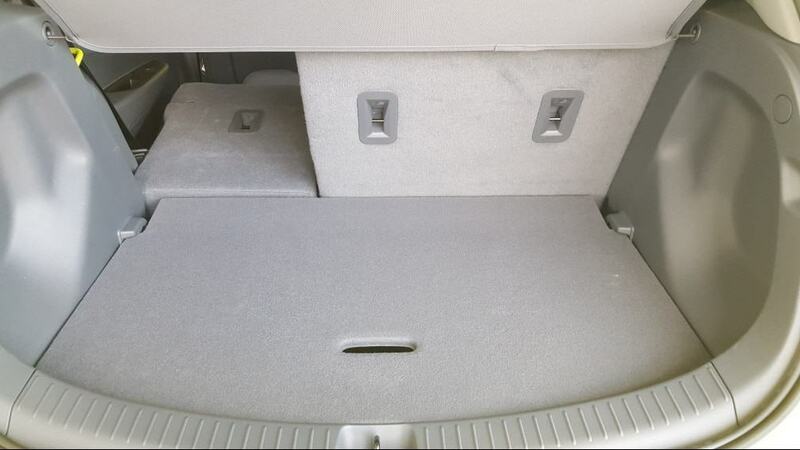 2019 Chevrolet Bolt EV trunk compartment. And speaking of space, the Bolt offers great driver visibility in the front, back, and sides. If all the electric vehicle technology wasn’t enough the Bolt EV offers a heated steering wheel, heated front, and rear seats, 10.2-inch color touch screen, wireless phone charging USB ports, and more. 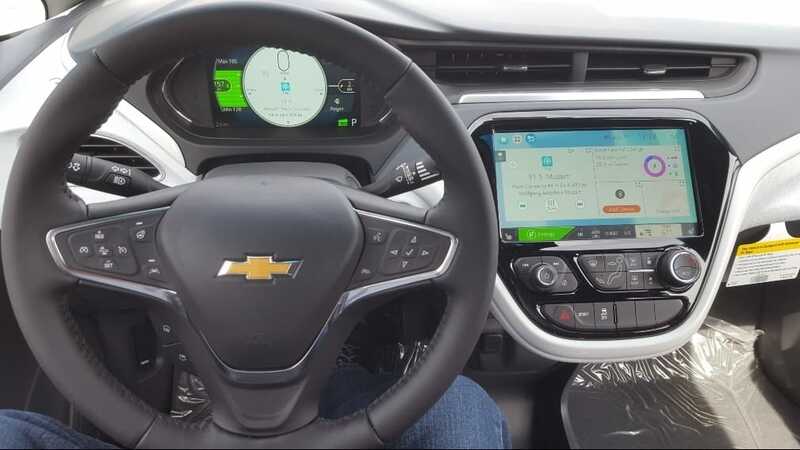 2019 Chevrolet Bolt EV cockpit dashboard view. Interestingly, I think another smart move, is the Bolt does not offer navigation. Instead, they focus on Apple CarPlay and Android Auto. I think that’s a great reallocation of resources on Chevy’s manufacturing side and savings for the customer. 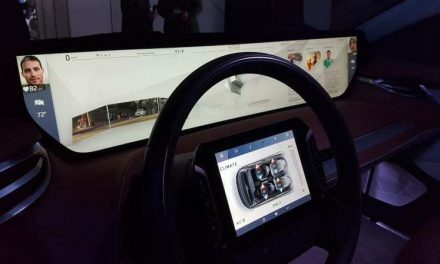 2019 Chevrolet Bolt EV center display screen. Who really uses their car’s navigation system anymore? One of my cars has a real-time (supposed to be anyway – definitely not always accurate) traffic indicator on the navigation screen but other than that, I’m using Waze. I do use my navigation in the car as a backup – but it’s always secondary. Forward Collision Alert – notifies you of potential contact. Front Pedestrian Braking – mitigates or avoids pedestrian contact. Low-Speed Forward Automatic Braking – under 50 mph contact mitigation or avoidance. Lane Keep Assist – with lane departure warning. Rear Vision Camera – with guidelines when backing up. 2019 Chevrolet Bolt EV birds-eye view display. Rear Cross Traffic Alert – uses radar sensors to monitor and alert you. Lane Change Alert – w/ blind zone alert for contact mitigation and avoidance. 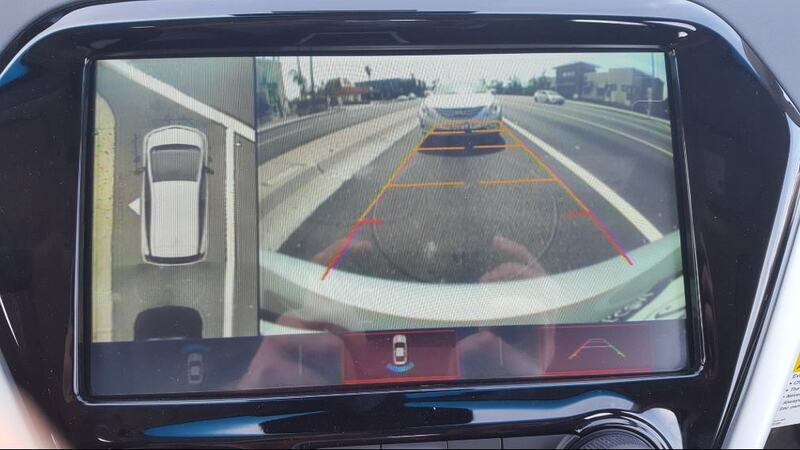 Rear Park Assist – sensors monitor stationary objects. Rear Camera Mirror – video enhanced rearview mirror. Surround Vision – Simulated 360-degree view surrounding the vehicle. Power – Great torque and 0-60 in 6.5-seconds. Range – 238-miles on a full charge is very impressive. Space – Very comfortable, loved the upright seating position 56.6 cu.-ft. for cargo. 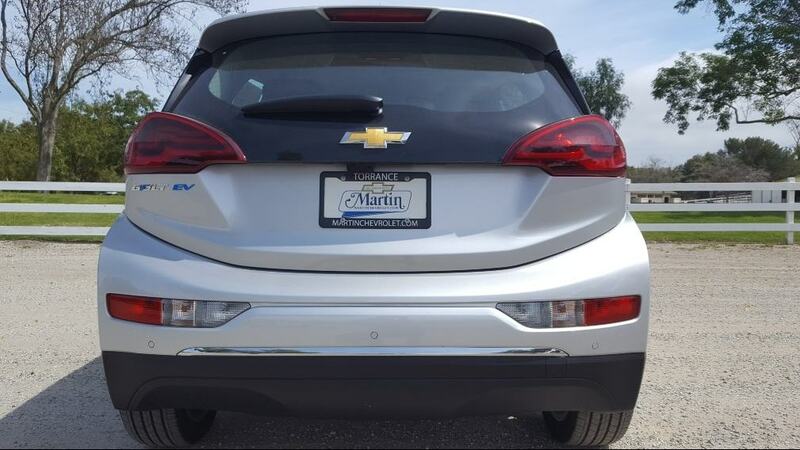 2019 Chevrolet Bolt EV rear. My thanks again to my friend Lewis Cook, General Manager at Martin Chevrolet for helping us bring this report to you! 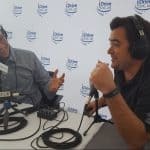 And if you want to hear why I like Lewis and his team at Martin Chevrolet so much – check out our podcast where Lewis talks, no-holds-barred, about the car buying process. Wow! Awesome to hear such straight talk!